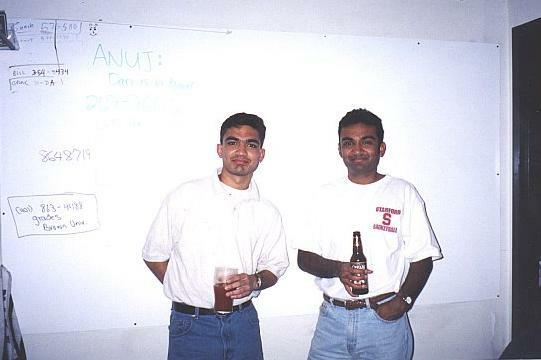 As kids growing up in small town Michigan, Anuj and Neal thoroughly enjoyed Halloween. Often their costumes fit together in a theme. One year, during their G.I. Joe phase, the two brothers went as Army Rangers (Kapil was way to small to pass as a soldier at that point.) A lot of planning and coordination went into those costumes including trips to the military surplus store and coordination with the neighbor kids so they could trick-or-treat as a unit of four. Trick-or-treating in Saline was great fun as most homes were very welcoming. There were kids all over the neighborhood with bags of candy steadily growing heavier. Anuj would sometimes run into an elementary school friend or two on his route. In the weeks leading up to Halloween, the Mohan family would pick out pumpkins from the local farmer's market and Anuj would carve them with Dad. Over the years the two of them got pretty good at this ritual. Regardless of the outcome though, the newly carved jack o' lanterns were proudly displayed outside the front door where they would welcome costumed kids to pick out candy from the Mohan stash. 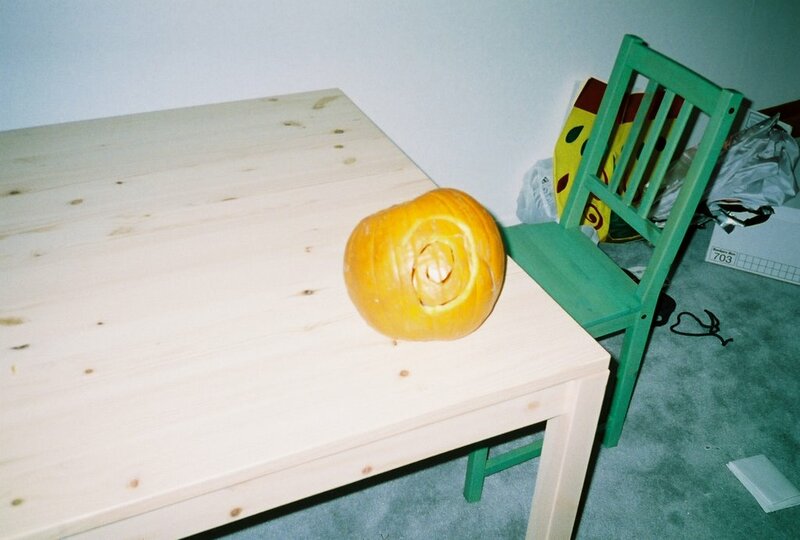 A couple years ago, Anuj brought a huge pumpkin over to Mom and Dad's home in the Bay Area. There he and Dad rekindled their love of carving pumpkins together. After years of being out of practice though, the results were not as good as they were growing up in Michigan. Undaunted, Mom used some of the pumpkin to create an Indian vegetable dish that was actually quite tasty. A pumpkin Anuj helped carve a few years ago. Fall 2001. Anuj and Neal together in Boston. Summer 1998. "Anuj was my cohort-mate, my partner in the leadership of the entrepreneurship club, and my close friend. Why did everyone say this? I think the reason why people couldn’t believe this sad news was because Anuj was so full of life. He was always smiling. He was always doing something new. He was always making a new friend or helping an old one. It was simply impossible for people to believe that someone so alive was no longer with us. Clearly this is the problem when we talk about Anuj. He was on Wharton’s Director’s List, the President of the Entrepreneurship Club, raised money for the National Kidney Foundation, a member of Alpha Delta Phi Fraternity, a leader in bringing guest speakers to Wharton, and a published researcher at MIT. If you hadn’t known Anuj, you might think I was exaggerating in this list of accomplishments. But if you were privileged enough to have known him, you would understand that this list of accomplishments barely begins to describe the man who Anuj was. 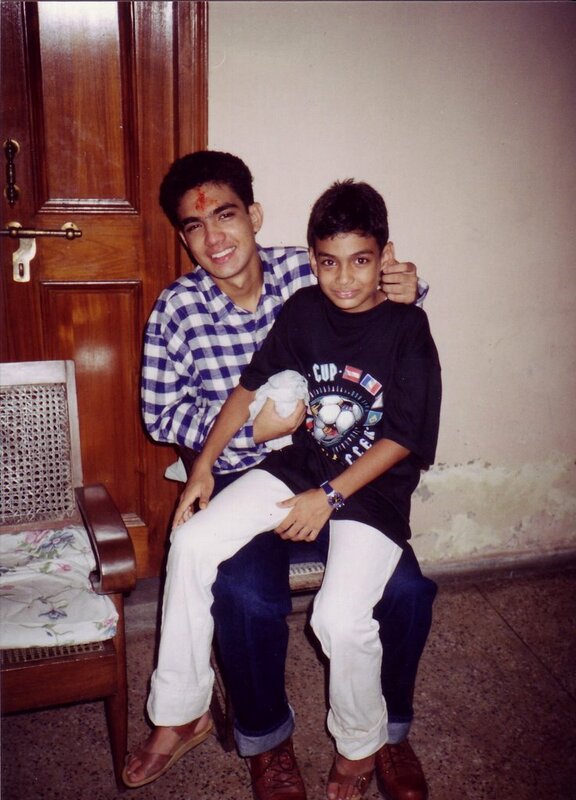 For me Anuj was a dear friend and confidant first and foremost. Last winter we ran cases with each other to prepare for consulting interviews – which as many of you know is an onerous experience at best. But Anuj’s chipper mood and good nature made the task enjoyable. The best way to honor Anuj’s memory is to continue the work about which he was passionate. The Mohan family has already done an excellent job of this by setting up the Anuj Mohan Scholarship Fund. I think all of Anuj’s friends are extremely grateful for this. 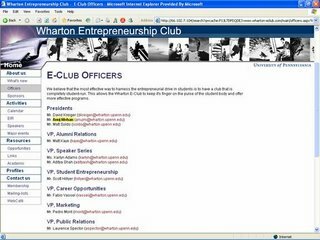 · First, we are dedicating the 2006-2007 e-club in Anuj’s honor and remembrance. 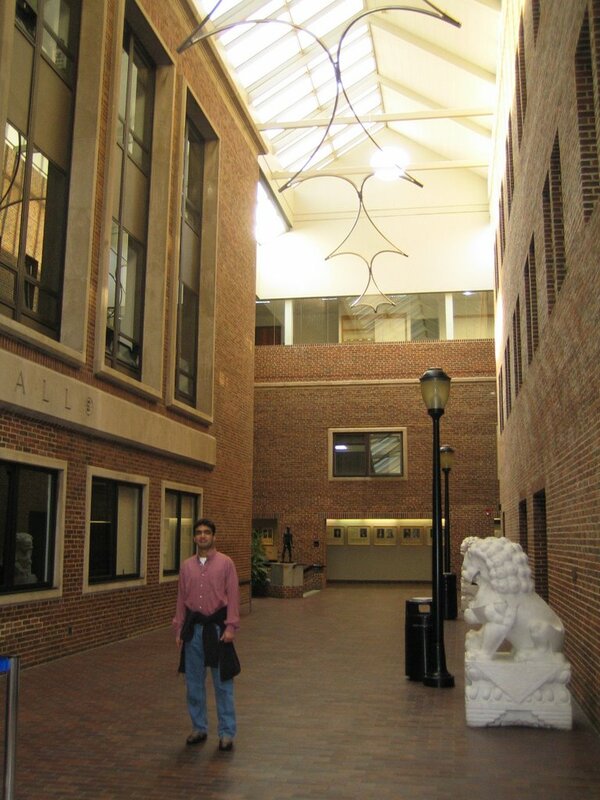 · Second, Anuj had a vision for creating a Wharton equivalent to the Mayfield Program. The Mayfield fund pairs students with partners at prominent VC firms. These partners act as a mentor to the student and arrange for them to have an internship in one of their portfolio company. This program is a great exemplar of Anuj’s passion for entrepreneurship and helping his community. The e-club is dedicated to making Anuj’s vision a reality. We hope that this program will serve as a perpetual monument to Anuj’s memory. Anuj invariably found a way to make special days brighter. Whether it was delivering a moving and memorable best man toast, supporting a friend on a significant occasion, or going out of his way to swing by and say "happy birthday", Anuj was always there. Any event that was important to his friends and family was automatically very important for him as well. That is why we know that even though he is no longer physically with us, Anuj will still somehow find a way to be there on our special days. Sharing a celebration at Mom and Dad's house. Fall 2004. During the early fall season, Northern California enjoys a virtually uninterrupted string of clear, cloudless evenings. This Diwali was no exception. Gazing upon the starlit sky, we could not help but think that one of the twinkling points of light was Anuj smiling down upon us this holiday. 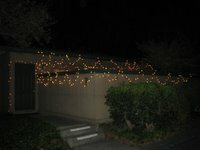 As previously described, for most years of his life, Anuj took the lead in lighting up the family's home on Diwali. Seeing the many bright stars breaking up the surrounding blackness last night, we knew Anuj was doing the same this year even though he was not physically with us. 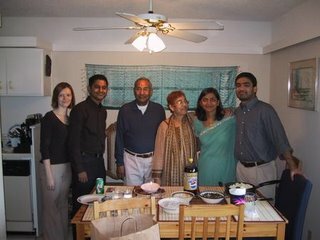 In 2002, when his parents first moved to the Bay Area, Anuj was able to spend Diwali with them after an interval of many years. He enthusiastically helped Dad put up lights in their apartment. The hooks and nails he put in place then would be used in every subsequent year when the Mohan family brought out the lights to mark the holiday. Last year on what would be his final Diwali, Anuj called Mom from Philadelphia to tell her that he had bought some lights for his apartment. 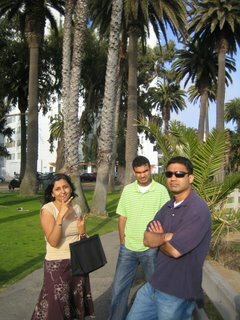 Given his intense schedule at business school, he could not make the trip out to California to share the holiday with his family. Nevertheless, he was determined to celebrate by lighting up his home just as he did while growing up. And he wanted to remind his parents to do the same using, of course, those very hooks he put up years ago. 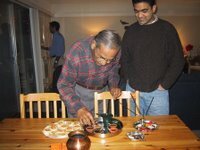 Anuj and Dad lighting clay lamps at his parents' home. Fall 2004. Diwali, also called the 'Festival of Lights' is one of the most important Indian holidays of the year. 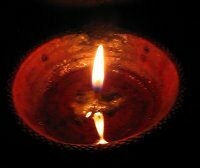 It marks the triumph of good over evil and people celebrate it all over the world by joyously lighting lamps throughout their homes. In India, children enjoy setting off fireworks of every shape and form from sparklers to bottle rockets. 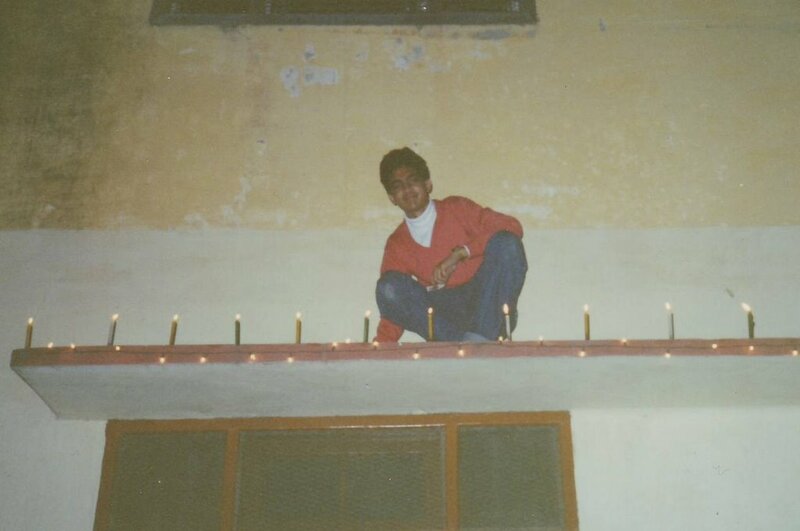 While growing up, Diwali was one of Anuj's favorite times of the year. Perhaps it was because the festival's message of righteousness, renewal and passionate celebration fit so well with his outlook on life. Every year, a few days before the big day, he would excitedly join Neal in selecting the loudest and brightest fireworks from a stand near Dad's office. The two of them would then carefully plan out how the Diwali light and sound show would unfold. 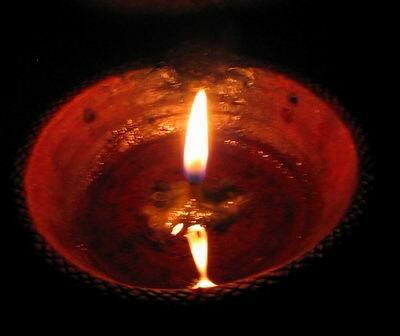 On the day itself Anuj would always be the first to volunteer to set up candles, clay lamps (or diyas) and other forms of light throughout the Mohan household. He would even climb up on the ledge around the perimeter of the house to make sure it was properly lighted. Oh, how he enjoyed celebrating Diwali to its fullest! Anuj lighting candles on the ledge of the Mohan family home. Lucknow, India. Fall 1993. Finally after a big dinner, the fireworks show would start. Anuj particularly liked the large bottle rockets. They created the most dazzling and far-reaching display. Sometimes defective ones would explode without launching and he would come very close to getting seriously injured. But Anuj didn't care. He was too caught up in the excitement of creating a spectacular sequence of lights in the night sky . Often he would carry firecrackers in his pocket until he found a suitable place to set them off despite Mom and Dad's repeated reminders about how dangerous that was. Anuj and Neal would spend many carefree hours putting on a show while little Kapil watched from a distance. This weekend is Diwali. It will of course never be the same. "Living well and beautifully and justly are all one thing." Anuj embodied this principle every single day. Those of us who knew him will always remember just how well he led his life. 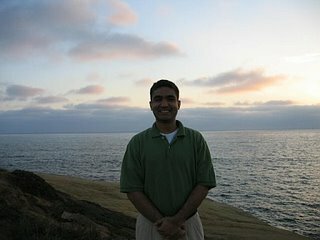 Anuj at Sunset Cliffs Park in San Diego. Summer 2004. Anuj, Kapil and Hema in Santa Monica, California. Spring 2006. "We stopped several times to observe street performers, reveling in the convivial atmosphere that attracts so many tourists and LA natives alike to this strip. Anuj and I were walking and chatting about his past year at Wharton when he stopped to look at a store across the street. "We discussed that store in one of our classes," he said slipping his hands into his pockets. It was Zara, a popular clothing store with showrooms in over 60 countries around the world. We decided to poke around the store for a few minutes. Once inside, I told him about my numerous shopping excursions at Zara. I showed him the price tags, which for many years would force shoppers to look at two columns of flags and prices in various currencies to track down the cost in US dollars. They had simplified the tags in recent years. He listened attentively, nodding his head while asking interesting questions about price points and what made women want to shop at Zara. As we walked outside, I realized that I had learned a lot about Zara from Anuj, but it wasn't by him regurgitating a bunch of facts he had gathered in business school. He taught me—whether or not his intent—by asking me a myriad of insightful questions. His was an insatiable, curious mind. No matter how much he knew about a particular topic, Anuj always felt he could learn something more. In sharing this curiosity so readily with those around him, he invariably helped others learn something new." 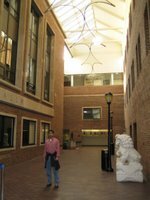 Several of Anuj's friends have commented on this blog and elsewhere about what a gifted teacher he was. 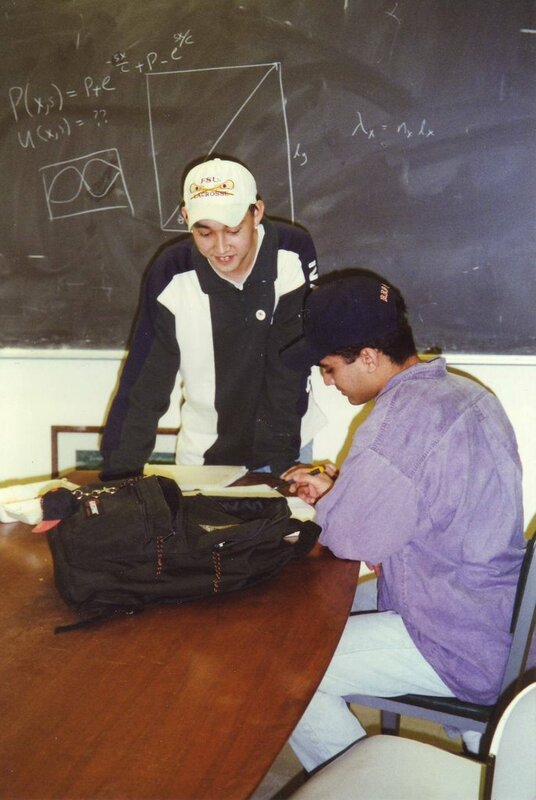 Whether it was hanging out in the dorm lounge to help some freshmen with tough MIT problem sets or staying an extra hour after an orientation session to help a fellow new MBA student who was a little rusty at calculus, Anuj always found a way to help. He had a knack for conveying even the most complex and apparently opaque ideas with utter clarity and ease, ensuring that his friends ultimately grasped the concept, whatever the subject was. Anuj's style was to guide people along to finding the answer themselves instead of simply handing it to them. When it came to teaching something to others, he adhered to the old adage that it was better to teach a man how to fish than to catch a fish for him. Perhaps the clearest example of this occurred not while he was deconstructing a business school case study for his project team or solving a product design challenge at work but rather during the simple act of tying a shoelace. One afternoon many years ago, Anuj gave his kid brother Kapil a pair of shoes he no longer wore. Kapil was extremely excited and started to try them on. But he was very young and did not know how to tie the laces on his newly acquired shoes. Until that point, Dad always tied them for him. So Kapil asked Anuj if he could team him. According to Kapil, Anuj did not tie the shoelaces for him or even show him how to do it. Instead he asked his brother to do the actual tying while he walked him through the steps. That way he ensured that Kapil not only learned how to tie his shoelaces but would not forget soon after. That afternoon, in about a minute, Anuj gave his younger brother a simple skill to carry with him for the rest of his life. Years later, Kapil realized the reason that he was able to learn from Anuj so fast was that while teaching something, Anuj created an atmosphere where it was okay to fail. This allowed people to take a chance and try something new on their own instead of waiting for the answer to be handed to them. This calm and comfortable yet articulate and precise style worked regardless of whether the topic was computer science or tying shoelaces. 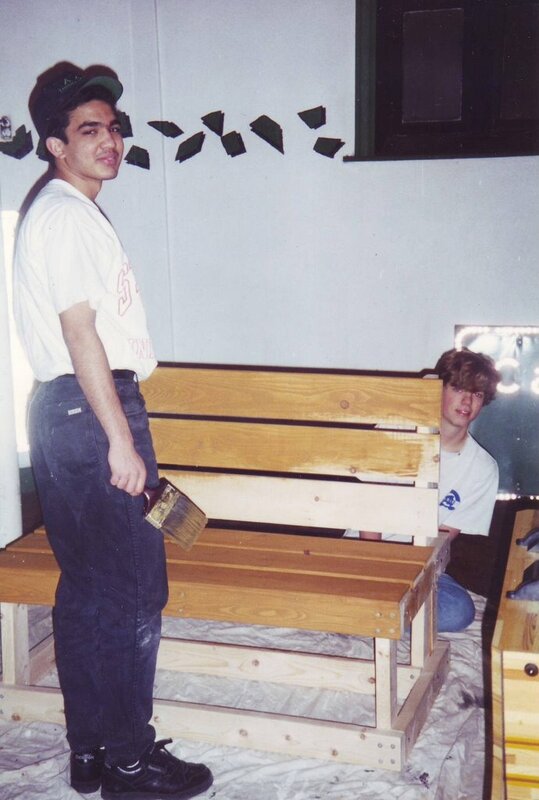 Anuj building a set of benches from planks of plywood with his friends. 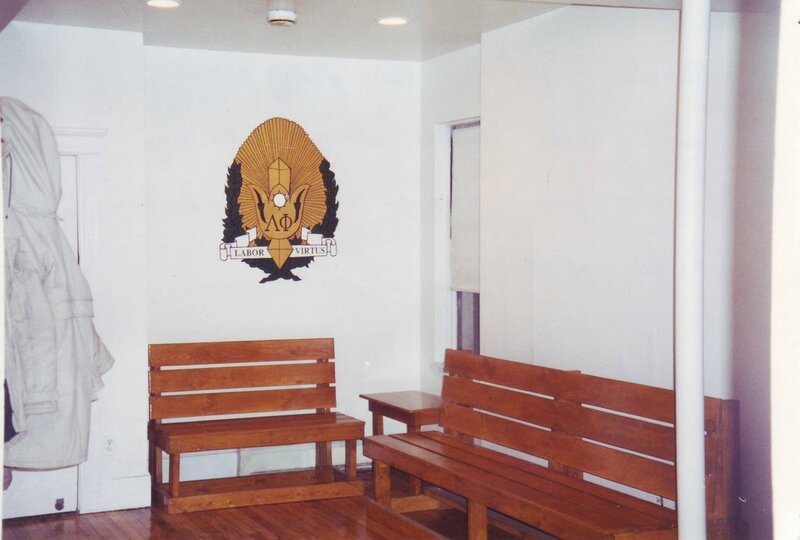 This was one of the freshman pledge projects in his college fraternity. On the right is the finished product. These benches still exist today over 10 years later. 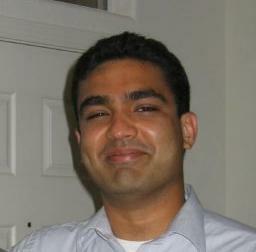 Anuj showed them to his parents when he took them to MIT in 2004. 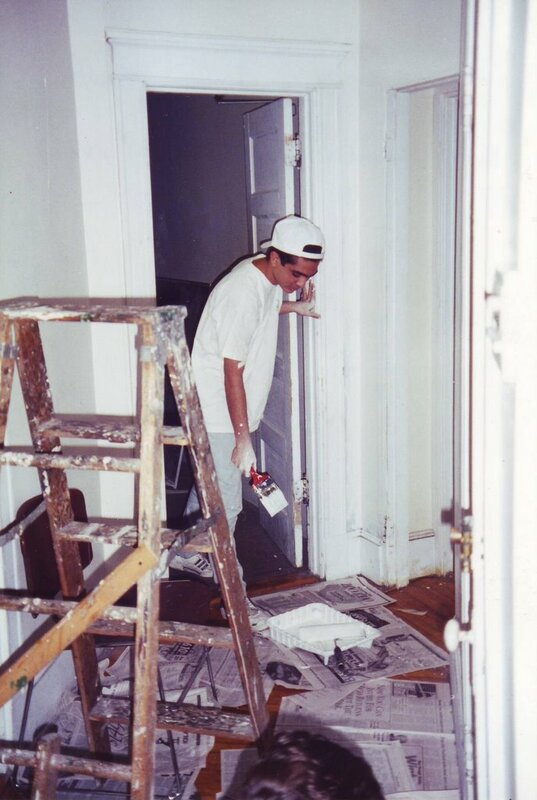 Anuj refinishing a set of rooms in his fraternity while in college. This was part of another team project. His friends all appreciated how Anuj made all these tasks so much more fun through his casual laugh, great stories and knack for taking any challenge that came up in stride. Anybody who spent time with Anuj knew what an incredible mind he had. We've already written about some of his contributions in the academic and professional worlds. However, Anuj also enjoyed working with his hands. The engineer in him really liked to build stuff. Anuj would often spend weekend afternoons constructing things from scratch like a bookshelf for his growing literature collection. Once he brought an old breakfast table to his parents' home. When they asked what it was for, he simply said it was going to be a project that he and Dad would work on together. Anuj thought it would be a great way for the two engineers to spend time together turning something apparently past its prime into a useful piece of furniture. 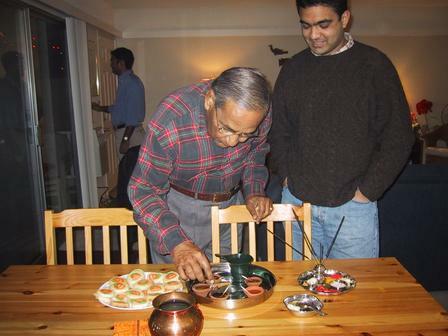 Anuj and Dad proceeded to repair, sand and varnish the table until it was like new. They both had a great time working on it that weekend. 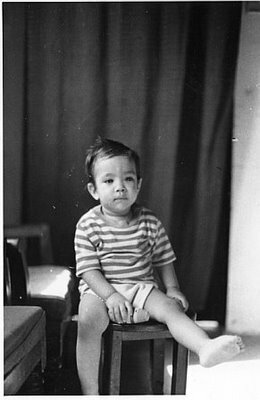 Mom and Dad used that table for years afterwards. In college, Anuj once built an entire basketball court in a week with some of his fraternity brothers. It was during "Work Week" when all residents took part in projects that contributed to the physical betterment of the house or otherwise improved life in the fraternity. Seeing potential in an irregularly shaped dead space behind the house, Anuj led a project to turn it into a recreation area that would be used not only by current residents but future classes for years to come. The finished product was not NBA quality by any means but it stands as a testament to what a powerful combination vision and craftsmanship can be. Anuj removing some rotten drywall while at Wharton. 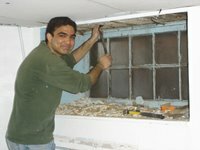 Anuj took his affinity for hands-on work into business school as well. This was particularly useful during a "Rebuilding Together" project where he spent hours reconstructing a home for underprivileged members of Philadelphia society. The bookshelf, table, basketball court and house are part of Anuj's legacy of creativity. These tangible reminders of his time with us are the physical complement to the innumerable novel and insightful ideas he left behind. We know that both will benefit his family and our society for years to come. Today, The New York Times ran an op-ed by Amitai Etzioni, a sociology professor at George Washington University, about how he has coped with the loss of loved ones. We wanted to include it in this blog because it is a matter of fact and thoroughly accurate encapsulation of how families grieve the loss of one of their own. SOON after my wife died — her car slid off an icy road in 1985 — a school psychologist warned me that my children and I were not mourning in the right way. We felt angry; the proper first stage, he said, is denial. In late August this year, my 38-year-old son, Michael, died suddenly in his sleep, leaving behind a 2-year-old son and a wife expecting their next child. When, at Michael’s funeral in Los Angeles, I was about to say a few words to the people assembled, the rabbi whispered that I need not fear speaking publicly — “Just go with the flow,” she urged. On both occasions, I had a hard time not telling the free advice givers to get lost, or something less printable along the same lines. There is no set form for grief, and no “right” way to express it. In my eulogy I divulged that I believe in a God who brings meaning to the world, but that my belief has been severely tested. I missed seeing God in the killing fields of Cambodia, and he seems too busy to show up in Darfur, or to shine his face on either the Sunnis or the Shiites in Iraq. With a rising voice, I asked: How could God allow a son to be taken from his aging, ailing father? A devoted husband to be torn from the arms of his loving wife in the middle of the night? How could he allow a 2-year-old to be left searching for his father in vain, or deny an infant the chance to see the father even once? This was all too intellectual for me. I did not choose for anyone to lay a glove on those I loved most, let alone send them on their last journey long before it was due. There might be an explanation for why God-awful things happen to very good people, but my colleague did not bring me an inch closer to accepting my ill fate. There seems to be an expectation that, after a great loss, we will progress systematically through the well-known stages of grief. It is wrong, we are told, to jump to anger — or to wallow too long in this stage before moving toward acceptance. But I was, and am, angry. To make parents bury their children is wrong; to have both my wife and son taken from me, for forever and a day, is cruel beyond words. A relative from Jerusalem who is a psychiatrist brought some solace by citing the maxim: “We are not to ask why, but what.” The “what” is that which survivors in grief are bound to do for one another. Following that advice, my family, close friends and I keep busy, calling each other and giving long answers to simple questions like, “How did your day go today?” We try to avoid thinking about either the immediate past or the bereft future. We take turns playing with Max, Michael’s 2-year-old son. Friends spend nights with the young widow, and will be among those holding her hand when the baby is born. I presume that many a psychiatrist and New Age minister would point out that by keeping busy we avoid “healthy” grieving. To hell with that; the void left by our loss is just too deep. For now, focusing on what we do for one another is the only consolation we can find. As we have blogged about before, entrepreneurship was in Anuj's blood. In fact, it was something he gravitated towards in every stage of his life no matter what organization he was part of. His time in the MBA program at Wharton was no exception. Soon after arriving on campus Anuj started engaging in events and activities geared towards current and aspiring entrepreneurs. He joined the Wharton Entrepreneurship Club where he brought business leaders to campus to share their experiences, managed expert panels at gatherings such as the annual Technology Conference, and generally led efforts to cultivate an environment where entrepreneurial ideas would thrive. Anuj not only participated in and eventually led programs that had existed previously at Wharton but, as any true entrepreneur would, brought a set of new ideas with him as well. One such idea was putting in place a fellowship for entrepreneurs at Wharton that would consist of a rigorous sequence of courses, a paid internship at a startup, and regular mentoring from industry leaders. Modeled after the Mayfield Fellows program at Stanford, this program would be sponsored by a prominent VC firm and allow deserving MBA students to hone their practical skills, and gain real experience, in the leadership of new business ventures. Over time Anuj's passion for entrepreneurship and ability to lead organizations, large and small, became apparent to his fellow students. He was elected Co-President of the Wharton Entrepreneurship Club. Anuj was incredibly excited to serve his classmates in this role and planned to implement a number of innovative programs during his second year, including his fellowship idea. Given his track record of finding a way to get things done for the people who counted on him, we have no doubt that he would have turned many of his new ideas into reality for the Wharton community. Anuj deep in thought on his first trip to India. The handsome young man we all knew started life as this beautiful little baby. He was about a year old here. Winter 1977.